EIT Digital is a Knowledge & Innovation Community (KIC), funded by the European Institute for Innovation and Technology (EIT). EIT Digital's main objective is to conduct cutting-edge research in the field of information and communication technologies and apply them as the No. 1 driver of innovation in fields of great societal need, such as energy efficiency, health in an ageing society, secure mobility and climate change. The concept aims to strengthen the synergies between the fields of education, research and innovation by promoting and systematically building regionally anchored clusters and international networks of the most efficient institutes, universities and industrial research centres. The selection of the best institutions was based exclusively on the criteria of excellence, innovation potential and the forward-looking cooperation model. 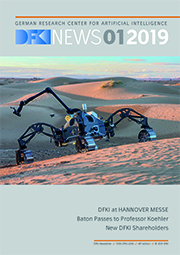 The DFKI is one of several core partners and is represented in two KIC nodes for ICT: at the European KIC Centre in Berlin with the DFKI project office in Berlin and at the national node in Saarbrücken. The German node is responsible for coordinating innovation throughout Europe, while Paris is responsible for research and Stockholm for education.